Back in July, the official magazine of the Church of Jesus Christ of Latter-day Saints, The Ensign, posted a request on their facebook page for pictures of Latter-day Saints involved in interfaith activities. A friend gave me a heads-up and I sent in a picture of me, my mom, and my sister at the Faith Feast this past April. 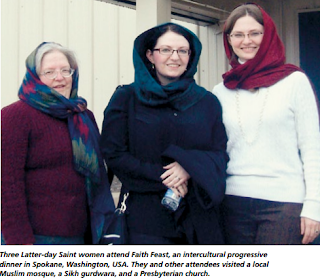 I'd pretty much forgotten about it until my facebook page was bombarded last week by friends commenting that they'd seen my picture in The Ensign and so I clicked on over to read the article they'd wanted these interfaith pictures for. "Becoming Better Saints through Interfaith Involvement" is a stand-out article by Betsy VanDenBerghe (here's a link to a pdf of the article if you'd like to see all the pictures). It contains wonderful counsel and great examples of Latter-day Saints working with those of other faiths to improve their communities, strengthen friendships and relationships, and serve others. I gratefully follow up on anyone’s interest in learning about the Church, but I also know that we Latter-day Saints take Jesus’s charge seriously to love our neighbor, clothe the naked, feed the hungry, and visit the imprisoned (see Matthew 25:34–36) without expecting the conversion of the recipient or those who serve with us. Sincere and respectful interfaith engagement never requires any group, including ours, to disavow its beliefs. Rather, it encourages participants to “contend against no church” (D&C 18:20) and “clothe [themselves] with the bond of charity” (D&C 88:125)...My experiences in community and educational causes have convinced me that the Spirit is strong when diverse people unite in a worthy mission. Brotherly love and pure motives propel service forward even more than the hard work involved. In his address to Christian leaders, Elder Holland acknowledged the “risk associated with learning something new about someone else. New insights always affect old perspectives, and thus some rethinking, rearranging, and restructuring of our worldviews is inevitable.” In befriending people of other faiths, I often find myself analyzing our differences, trying to distinguish the cultural divides from the doctrinal ones, all the while trying to appreciate everything virtuous and lovely they have to offer. Indeed, the effort sometimes feels risky, but it is always worth it. In the process of restructuring my paradigm, I find myself shedding more of my superficial cultural tendencies and coming closer to the essence of the gospel. I appreciate Elder Holland's acknowledgement of the "risk associated with learning something new" and that "rethinking, rearranging, and restructuring of our worldviews is inevitable." That's a good thing! As scary and "risky" as it feels, "it is always worth it." I whole-heartedly agree. Serving alongside others not only helps them to understand us, but it also motivates us to learn from them and become more aware that God is “no respecter of persons” (D&C 1:35). He assists good people in all faiths and cultures in their efforts to improve the lives of His children. This recognition of the good in others helps us remain humble—as opposed to the Pharisees Jesus condemned for their spiritual pride (see Matthew 23) or the Zoramites, whom the Book of Alma portrays as exclusive and arrogant (see Alma 31). Openness to the good in others enables us to become better people. That's what we're working for, isn't it? We want to become better people. So I'll learn all the good I can from Muslims, Sikhs, Presbyterians, Evangelicals, Buddhists, Jews, atheists and every other person I come in contact with. And hopefully, they'll be able to learn something good from me as well. Betsy VanDerBerghe, the author of the article in the Ensign, just left this comment on the BEB facebook page!
" I'm thrilled to meet one of the women in this awesome photo accompanying the article I wrote! Thank you for submitting it to Church magazines, who picked out all the photos. I loved the selection, especially this one, as it spoke volumes about showing the respect for others' religious customs and observances that we hope others will show for ours. I tried to comment on your blog, but don't think it went through, so excuse the long FB comment. Just wanted to say thanks to you and your sister and mother for exemplifying the second great commandment and for capturing in your blog the message I was trying to put across."